Ah, Susanna Hoffs. The girl who taught us to walk like Egyptians. Not that we really needed teaching. I mean, I can’t exactly read hieroglyphics, but it’s not too hard to get the basic moves down. It certainly was a catchy tune, though, which made Hoffs and her band The Bangles quite popular back in the 80’s. It was enough of a hit to give someone the idea of turning Ms. Hoffs into a movie star. That someone was actually her mother, Tamar Simon Hoffs, who served as writer, producer and director of 1987’s The Allnighter. Hoffs plays Molly, valedictorian at California’s Pacifica College. 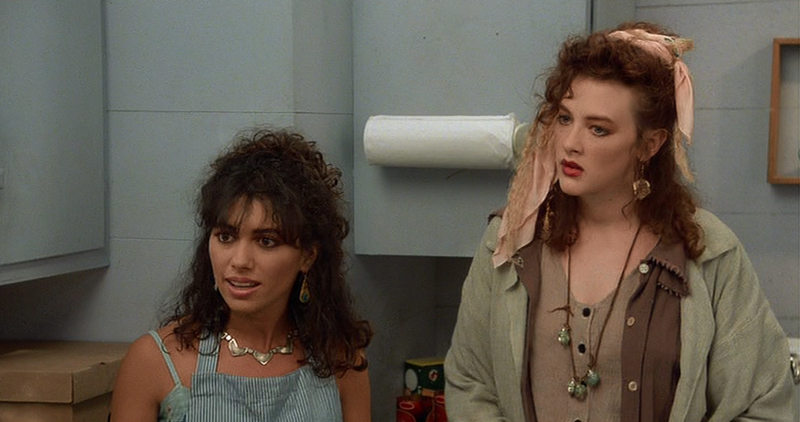 She lives in a beach house (because money-strapped college students can afford to live in beach houses) with her gal pals Val (Deedee Pfieffer) and Gina (Joan Cusack). Frequent visitors to the house are surfers CJ (John Terlesky) and Killer (James Anthony Shanta). They basically just walk through the house on their way to riding the waves, which means CJ is too stupid to realize that Molly has the hots for him big time. On the eve of graduation, the girls are gearing up for the big annual party known as the Fiesta. It’s going to be the best night of the year! It starts well when a rock star (Michael Ontkean) who used to live at the house drops by for a bit of nostalgia. After dancing with Molly, he tells her she should pay him a visit at his hotel. She still has her eye on CJ, however. Before long, the plans to attend the Fiesta start to change. Val gets a surprise visit from her fiancée and Gina is too focused on finishing her final video project. Molly ends up heading off to the party on her own to try and admit her feelings to CJ. When another girl draw his attention away from her, she goes back to the beach house in tears. After dancing in front of a mirror in her underwear to Aretha Franklin’s “Respect” she decides to pay the rock star a visit at the hotel. When Val and Gina try to meet up with her, they end up mistaken for hookers by the hotel detectives. Seriously, hotel detectives? What are we in Raymond Chandler novel!?!? If Wikipedia is to be trusted, Tamar Simon Hoffs became the first woman to be credited as writer, producer, and director on a major studio film with this effort. Um…ok…how do I say this? That’s an important moment, but it would’ve been nicer if the film that delivers that achievement weren’t so awful. The story here is an absolute mess. I hesitate to even call it a story. The film is completely lacking in focus and just winds around several different scenarios, many of which never go anywhere. Don’t even get me started on how it comes across as just a wee bit weird when you realize that the lead actressses mother directed her in a scene where she dances in her underpants! I’ll take Susanna Hoffs any day as a classic 80’s rock chick. With that giant smile and big brown anime eyes…super cute and she rocks the house. As an actress, however…well, this was her only starring role and that’s probably the way it should be. A bright spot in the cast, however, is Joan Cusack. She brings a fun quirkiness to her role. She’s way above the pay grade of the rest of this movie. Of course, she would have an Oscar nomination for Working Girl the following year. It’s also fun to see Pam Grier in a small role as the tough police chief keeping the girls behind bars. About the only thing I really enjoyed about The Allnighter was that it made me rediscover an obscure 80’s song I had completely forgotten about. The song “No TV, No Phone” by Price Sulton is used during the film and again over the end credits. It’s a catchy little pseudo hit that I probably hadn’t heard in 20 years. So to the mother/daughter team of Hoffs, I thank you for that. Otherwise, I was very grateful that this “allnighter” only used up an hour and half of my life. Very cool review Todd. I was a fan of The Bangles back in the day(Their cover of Hazy Shade of Winter is still good) I have heard of this film and didnt want to watch it then and dont want to watch it now. Although the scene of Hoffs dancing in her undies does have my interest.